What is Sweet Home 3D? How can I make interior stages for MMD? 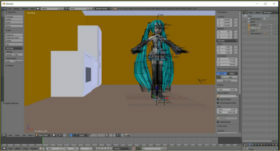 Where can I make my own stage for MikuMikuDance? How do I use Sweet Home 3D to make a stage? Now Miku has a place of her own to relax! 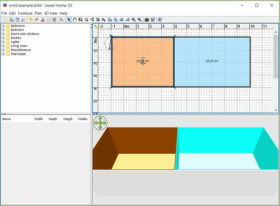 Sweet Home 3D is a free architectural model making software. The designers wanted to let people create 3D models of homes without a ton of hassle. (Like MMD, but for architecture.) Sweet Home 3D comes pre-loaded with furniture, walls, doors, making customizing rooms very simple. It was initially written in French, but it now supports a dozen language options, including English, Spanish, and Japanese. Sweet Home 3D, which is downloadable at this third-party link. You could also use a .pmx plugin to create stages you can animate, but I’ll only be showing the basics. When you open Sweet Home 3D, you will see a grid on the top right of your screen. This grid is your workspace. Below that is a 3D preview. If you have a floor plan image that you want to use, you can open it and trace walls on top of it, or you can freehand the design. I’m going to freehand the design of a stage with two rooms, a living room and a kitchen/dining room. To start, I’ll add the walls. Click on the wall icon and draw out the walls. Click to start and end the walls. The new wall will start as a corner of the old one. When you are done, press escape. Now, click on “room”. 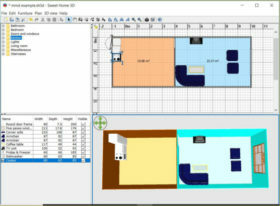 If your room is enclosed, the program will automatically create a floor when you click inside the room. Without walls, the room function will only create floors. Double-clicking on a room using the pointer tool will open a “modify room” dialogue, where you can change wall and floor colours and textures. I’m making the living room blue and the kitchen orange and brown. The fun part is next. By default, Sweet Home 3D organizes furniture by room in the panel to the left. Click on one, then click on the chair icon to add it. Doors and windows must be attached to the walls, but other objects can go wherever you like. Here, I have added an arch to the door, windows in both rooms, and a few key pieces of furniture. When you are happy with the look of the room, click “export to .obj” in the “3D View tab. Choose “export all”. In Blender, make sure you have your scene set to metric units. This will help with sizing the model. Then, import it. You may notice that your new stage is very large and very complex. Press control + J to join all the new objects into a single mesh. If there are too many meshes, join them in small groups until you have one mesh. Go into edit mode, and move the model until the origin is in a better place. Note this was scaled 0.15 times, but you’ll want it smaller. The stage before and after scaling, with Animasia Miku as a reference. (You don’t need the Miku.) Note this was scaled 0.15 times, but you’ll want it smaller. 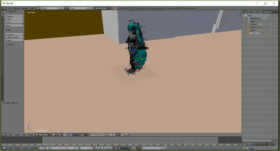 Now scale the model to 0.015 of the original scale in edit mode. This may seem like a lot, but the file is currently gigantic. If the model disappears, just zoom in. 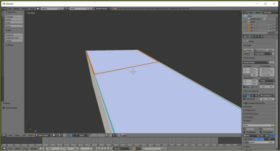 The file could be so large that it was culled when you shrunk it, meaning Blender decided it was too far away to render. Once you’re happy with it, export it to a DirectX (.x) file and load it in MMD. You may have to modify the size some more to get the stage to the best size for your models. 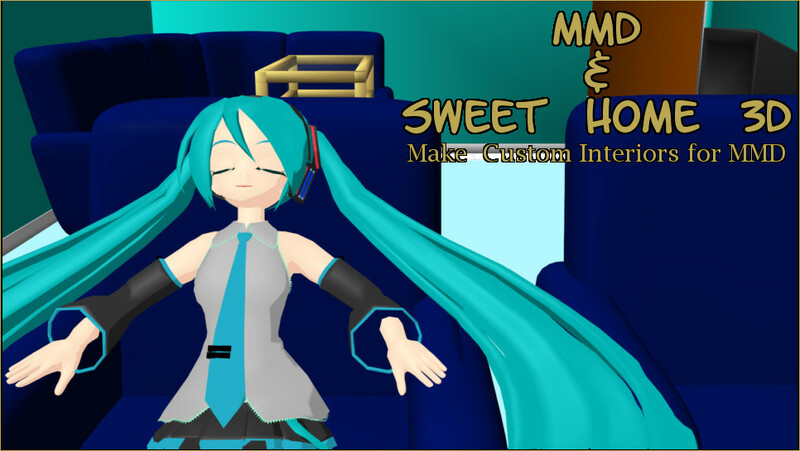 I had to shrink my model by 0.1 in MMD because it was too big, but my export was only .15 the size of the original Sweet Home 3D file. The file is successfully imported! I only discussed the basics of using Sweet Home 3D in this article. You can do much more with it. Don’t be afraid to experiment, explore, and make mistakes. Remember to Keep the Faith and credit Sweet Home 3D if you make a model using their program. 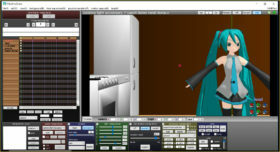 can I use sweet home but not blender? Well, technically PMXE does have an .obj import functionality, so nothing stops you from trying. Why don’t *you* tell *us* if it works? Which program is “it”, Ahmad? PMX? What file are you trying to load?